The Baker Hughes U.S. rig count was up by six this week to 1,782. Oil rigs were down 13 to 1,388, gas rigs were up 19 to 388 and miscellaneous rigs were unchanged at six. Over the past six weeks, gas rigs are up by 39, or 11%. By type, horizontal rigs were up six to 1,073, vertical rigs were up ten to 432 and directional rigs were down 10 to 277. Among gas rigs, horizontal rigs were up seven to 261, directional rigs were unchanged at 78 and vertical rigs were up 12 to 49. 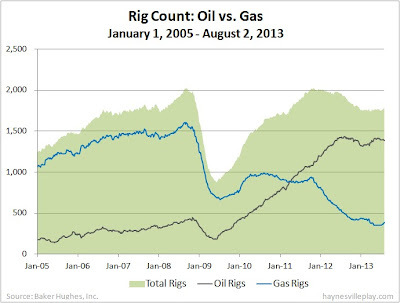 The one week increase in vertical gas rigs was 32%! While that seems like an awful lot, last week's count of 37 vertical gas rigs was the low for the year and 49 makes more sense relative to the count year-to-date.